Gisela 5	: Dwarf Cherry Rootstock giving a final height of 2.5 metres. Ideal for gardens and easier for bird protection. Colt	: Semi-Dwarf Cherry Rootstock giving a final height of 3.5 metres. Hexaploid Colt :Very similar to Colt (3.5 metres) just a different rootstock. Bush	: This means there are branches that start close to the bottom of the tree. Maiden	: The tree is 1-2 years old. Bare Root	: The Cherry tree is sent between November and March without any soil around the roots and no pot. Generally purchased because they are cheaper. All fruit trees certified virus free with a FREE FRUIT TREE WARRANTY. Most are UK seeds/grown with up to 4 years root and 2 years tree growth or more. Smaller rootstocks can bear fruit the first year. Looking to buy several fruit trees? Click here for our FREE FRUIT TREE OFFER. All basic pruning requirements completed before delivery. Merton Glory (Prunus avium 'Merton Glory') is an attractive, very large, sweet, heart-shaped cherry, first introduced in 1931. An outstanding early white cherry. The trees are compact in form. The cherries can bruise easily if roughly handled. Self-Fertile/Not Self-Fertile: This cherry is not self fertile. Cherries Stella and Sunburst will make suitable pollination partners. Message card included at no additional cost if required. Most fruit trees will give you AT LEAST 40 years of fruit. Pears can go to 70. Records of 200 year old trees exist but this is the exception, not the rule. Do I Need To Stake My Bare Root Fruit Tree? To date, we have checked the passports of our trees and none seem to have sneaked off for non UK holidays so all are UK grown. Cherries will split because of too much water. When it rains the roots take up water and as the air is humid, does not allow the cherry to "breathe". With container grown cherry trees, you can place an umbrella (we kid you not) over the tree to control watering to a better degree. 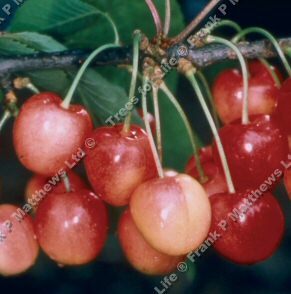 If you find your garden planted cherry tree regularly has split cherry fruits, consider improving drainage close to the tree e.g. soakaways. Dig a hole three times wider than the pot in came in but just as deep. Place your cherry tree in the middle and fill with the remaining soil. If soil quality is in doubt, mix the excavated dirt with well rotted manure or compost to a 50:50 ratio. Water well (1-3 times a week depending on weather) for the next few weeks. Do not add fertilizer to the removed earth as the roots need to be encouraged to spread out. Do not plant if the ground is frozen or waterlogged. Soak the Cherry tree roots in a bucket of water for a few hours. Dig a hole wider than the rootball. Make a mound in the middle of the hole to support the centre of the cherry tree rootball whilst allowing you enough room to trail the roots out. The more you can spread them out the better. The previous dirt line on the tree will be evident, the mound needs to be large enough to ensure this is in line with the top of the hole. Placing a piece of straight wood across the whole gives you something to check alignment with. Basically don't plant the Cherry tree any deeper than what it was before it was rudely hauled out of the ground. Fill the voids with the fine earth first, you are aiming to eliminate all or most of the voids. Gently compress to firm the earth but not compact it. Do this in layers around 4-6 inches at a time. Add a mulch layer. This is to prevent weeds and grass competing for nutrients within a 1m or 3ft radius around the tree. Use gravel, mulch mats, manure, bark or whatever you want to block the light getting through. Do not use herbicides on or near a young tree. Before new leaves appear in Spring, apply a Nitrogen/Potassium/Phosphorous fertilizer although they mainly need Nitrogen. Nettle compost soups are a cheap way of achieving this albeit labour intensive. One of the biggest problems you will have with container growing cherry trees is lack of water. If the soil is dry around 15cm or 6 inches into the soil it is time to water. We use a soil moisture meter because we are lazy, cautious and love gadgets. There are many methods of deterring birds from eating your beloved cherry crop from threatening to sue them in bird court for theft to painting each cherry with lemon juice but by far the most effective method is to surround the tree with netting.